Arts | curated sf: Eat. Shop. Play. Upon stepping into Artillery Apparel Gallery, you’re immediately faced with a huge, gold framed easel, holding a t-shirt, stretched like canvas, in various stages of painting. This is no upright screen-print job, but rather, hand-painted t-shirts by Artillery AG’s owner, Ivan Lopez. Lopez is straight up, born-and-bred Mission hip. After studying Industrial Design at Pratt and selling his shirts on street corners in NYC, he returned to SF and open Artillery AG right in his hometown hood — the Mission. Artillery AG opened in 2009 with 7 local artisans and now features over 40 of the Bay Areas best designers, taking over 70% of the store’s merchandise. Lopez says he wanted a concrete, creative environment to promote independent art and design. The stores features North Beach’s Indie Industries, Nicacelly reconstructed women’s apparel, Platinum Dirt leather clutch bags, and elegant silver jewelry by Maria Engracia. Headlining all of the merch is Lopez’ signature painted t-shirts. 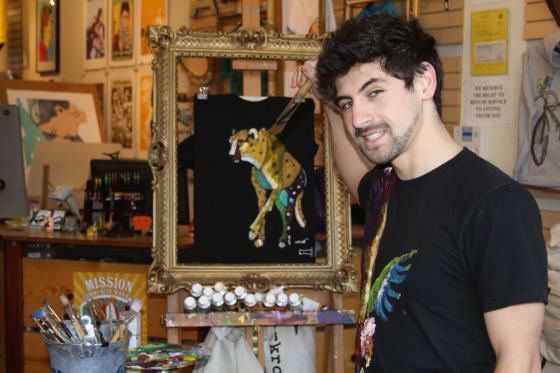 Lopez hand-paints each shirt right in the store, with his special blend of acrylic and fabric medium. The shirts are then heat-pressed to lock in the lively designs, ranging from kitschy ice cream cones to vibrant animals. The shirts start at $35, with custom work available, starting at $45. The best part? Great art is always a great excuse to party. Artillery AG throws a big, “Art Is Good For You”, art show every two months. This Saturday, join in on the festivities and check out SF artist, Shawn Ray Harris‘ 3-D photography. This show will feature a series of photographs shot on Harris’ home-built camera, exclusively for Artillery AG. Sean Ray Harris at Artillery AG (2751 Mission St.), Saturday Feb 5 – April 1. Opening reception Feb 5 from 7:30pm – 11pm, featuring live music. The window displays around Union Square are all a flutter with fancy tutus and pretty pink pointe shoes, circling buzz for the SF Ballet’s 2011 Season, opening with Giselle this Saturday evening. The ballet is a classic place to see and be seen in SF. With that in mind, we’re channeling our inner Gisele, and thinking long, lean and elegant. For the perfect night at the ballet, remember that simple can be devastatingly beautiful. Look and feel as graceful as any prima ballerina in this classic one shoulder champagne gown. If you’re hesitant to wear a floor-length frocks, don’t you fret — a belted higher waist will lengthen your legs, while adding shape. Get even more leggy with a pair of strappy black pumps, featuring a small platform for comfort. And finally, add a little Black Swan edge to all that elegance with a textured satin clutch and silver studs.